It’s World Food Day, an annual celebration marking the establishment of the Food and Agriculture Organization, which was founded in 1945. This year, the day honors family farmers with the theme of “feeding the world, caring for the earth.” The United Nations named 2014 “The International Year of the Family Farmer” to emphasize the key role that small-scale growers play in global food security. We’ve been taking a hard look at hunger in recent months, trying to get at the root causes of under- and malnutrition. The picture is not always as it appears. The world is not short of food. The reasons people go hungry are complicated, often political, and frequently misrepresented in the news. For example: land titles. Not the most common subject of news reports on “how to feed the world” or “the future of food.” We hear about the need for new technologies, more efficient farming methods, increased production capable of feeding a planet of 9 billion people—all meaningful points. 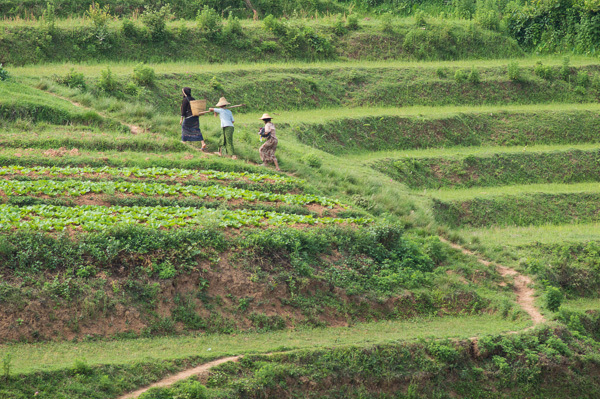 But in some parts of the developing world, land rights must come first. If a family loses its farmland to an industrial agricultural operation, it might not matter how much food that corporation produces; that family may very well go hungry. Or be forced to move and find new work. Or be incapable of paying for the food grown on the land the family previously farmed. Or all of the above, while the corporation’s food goes to someone else with more money. 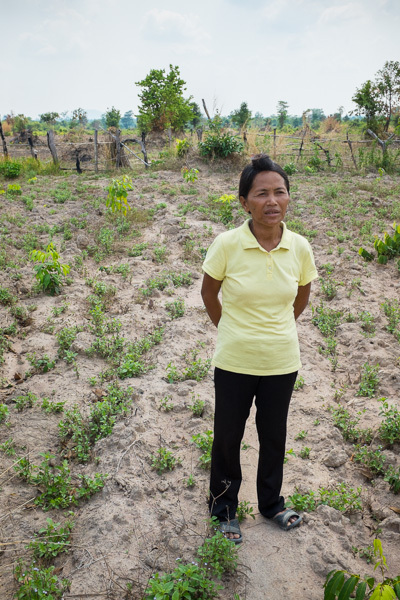 Cambodian Chhek Sambo stands on the land she is fighting to secure. Her village is embroiled in a longstanding dispute over land titles, ever since a local official sold their fields out from under them. It’s a complicated story. 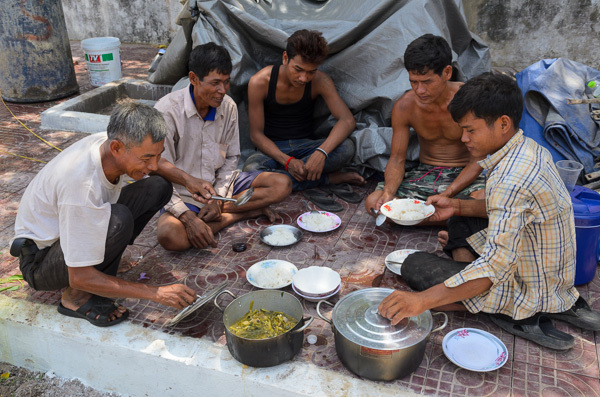 Sambo and her neighbors settled this property years ago, at the end of the Khmer Rouge war. There were no legal titles then, just the permission of a local official. But now, wealthier investors want the land—as the villagers struggle to feed themselves while simultaneously fighting the legal battles necessary to get an official title. More to the story here, in Slate. But even a proper title doesn’t necessarily mean the land is secure—not in Cambodia. 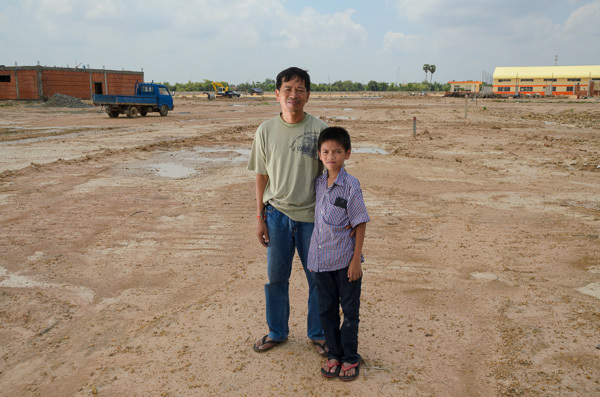 Here, our good friend, Rith, a journalist, stands with his son, Soseth, on the land that grew their family’s rice for 30 years—until a Taiwanese company built a factory on the edge of his fields. Rith says he doesn’t know who really owns the factory or what it will produce, but a powerful company broker has successfully persuaded several nearby farmers to sell their fields at a cut rate. Rith, like a few others, refused. The company built walls around the surrounding fields—nothing but dirt now—and dug giant holes that caused several fields to collapse. Other plots, like this, are smothered in runoff. Rice will no longer grow here, Rith says. Local officials want him to take a substitute parcel of land in another area. But Rith says that is not a proper solution. He has a legal title to this land, which he worked and farmed for decades. No more. 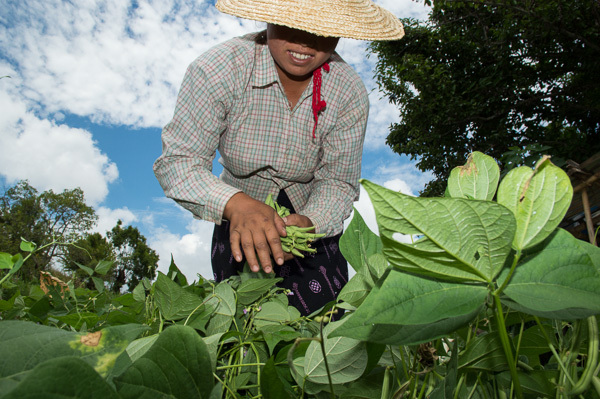 In Shan State, Myanmar, Danu farmers grow green beans for their own families. What they don’t eat, they pack into sacks and transport (by foot or motorbike) to the nearest small town or village with a train stop. It’s not a lucrative job, but this type of small-scale farming has long sustained rural life. 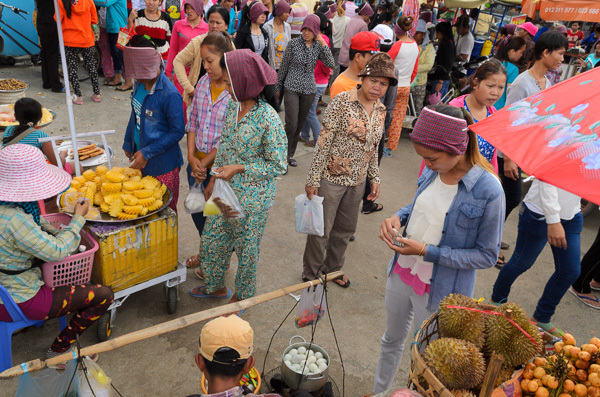 Villagers say most people don’t accumulate much money; many don’t have bank accounts. They often trade the foods they grow for the supplies they need. 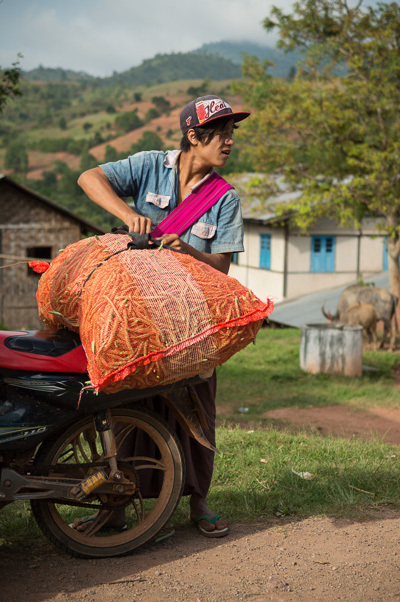 They and their ancestors have occupied this part of Shan State for generations, and here the people are not afraid of losing their land (in other regions, the story is very different). But there is another problem. “The land is tired,” villagers say. As the population grows and families expand, farm fields are divided among more and more people. Farming becomes more intensive. It requires more chemicals (in decades past, none were used). Insects are constant threats, and village elders wonder what will happen in the future. They have land—but it’s not enough for the people or their livestock. What will the people farm next? Where can they turn, when “the land is tired”? The people pictured above are on lunch break from their day jobs. They are obviously not farming—but chances are, they once did. Many still do. They plant their fields in the countryside, then work in garment factories or construction jobs in the city until it’s time to harvest. This is Cambodia. This is the story of many countries in which family farming is a constant struggle for survival. In previous years, people say, they needed very little money to survive. It’s different now. Yes, some of today’s money goes toward cell phones and motorbikes and new clothes. But it also goes toward bribes, and the fees that teachers charge in order for their kids to pass from one grade to the next, and the exorbitant interest paid on loans taken out when a family member gets sick and the doctor requires payment before offering treatment. If debt becomes overwhelming, many are forced to sell their land. And then they end up here, in the city, with nothing to plant or harvest. For many of the world’s poorest family farmers, a simple problem can lead to years of struggle. The above two photos indeed depict an image of modern-day family farmers: working off the farm, away from the land they once maintained. Colin, welcome back to Cambodia! I am sorry to hear about your daughter – as you know, dengue remains a huge problem in a country with far less-than-ideal health services. You have asked a giant question: progress in the past decade. As I’m sure you’re seeing, much has changed visibly – the country is far more developed. Roads, buildings (high-rises in Phnom Penh! ), technology (free, functional WiFi in so many places), etc. A younger generation has emerged with big dreams and opportunities that didn’t exist a decade ago. But still, the root problems underlying extreme poverty and corruption also remain. And when I talk to some of the country’s poorest people, I don’t find much hope. Would love to hear your thoughts as you see more of the country.